Yes, it really is edible right to the core, the only bit you can’t eat is the stem and vase. Each tree is handmade, by our little sugar elves! 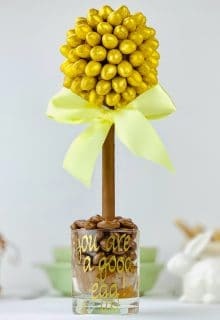 The centre of the tree is fully edible, a chocolate toffee crisp centre, so once you have picked the Maltesers® and eaten the handmade chocolate button flowers, just keep munching! Every tree is cellophane wrapped with a satin ribbon, then protected with lots of bubble and sent is a made to measure box, to ensure your tree arrives safely. Make personal with an option to hand script a message on the glass vase with a message of your choice up to 25 characters. The larger size is ideal for centre pieces for a wedding or children’s parties – a great sharing gift. Maltesers®, Belgian chocolate and sugar flowers. Sugar, Cocoa Butter, Whole Milk Powder, Cocoa Mass, Emulsifier, Soy Lecithin-E322, Flavouring, Natural Vanilla. Rice Krispies contain rice, sugar, salt, malt flavoring, iron, ascorbic acid (vitamin C), alphatocopherol acetate (vitamin E), niacinamide, vitamin A palmitate, pyridoxine hydrochloride (vitamin B6), riboflavin (vitamin B2), thiamin hydrochloride (vitamin B1), folic acid, vitamin B12 (as cyanocobalamin), and vitamin D. Milk Chocolate (Sugar, Cocoa Butter, Skimmed Milk Powder, Cocoa Mass, Whey Powder, Lactose, Butteroil, Emulsifier; Soya Lecithin; Flavouring), Malt Balls (Glucose Syrup, Whey Powder, Malted Milk Powder, Salt, Raising Agent: Sodium Hydrogen Carbonate) Sugar, Malt Extract, Coconut Oil, Emulsifier: E471), Glazing Agent: Gum Arabic, Shellac. Glucose Syrup (Sources include Wheat), Barley Malt Extract, Cocoa Mass, Vegetable Fat, Emulsifiers (Soy Lecithin, 492), Wheat Gluten, Raising Agents (501, 500), Salt, Natural Flavour (Vanilla Extract), Pectin.